Hey Yall! This past weekend, the girls and I went back to our usual routine of attending Williams-Sonoma American Girl cooking classes. I noticed that Williams-Sonoma has cut down on their cooking classes, especially the ones that were free. I wonder why, though? Did it take up too much of their time? Wasn't worth having so many? Well...who knows! I'm just glad they have these cooking opportunities for both adults and children. 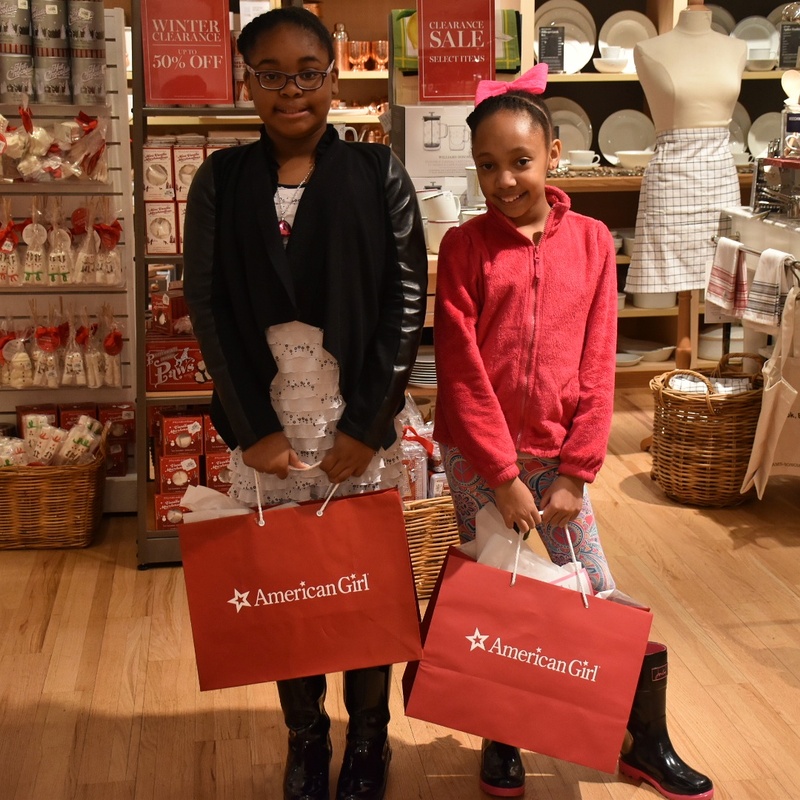 This month's American Girl Culinary Class was all about Breakfast Parties, whipping up delicious homemade waffles the morning after sleepover fun with all your friends. Fun and Yum! The girls kept their dolls at home this time so they could fully focus on all the instructions in class. They were very hands on mixing up the ingredients and taste testing, so the last thing they wanted to worry about is where to place their dolls. Preheat a waffle maker according to the manufacturer's instructions. In a medium bowl, whisk together the flour, sugar, baking powder and salt. In a large bowl, whisk the eggs until light and frothy, then whisk in the milk and melted butter. While whisking gently, gradually add the flour mixture and mix just until combined. The batter will be lumpy. When the waffle maker is ready, pour batter over the cooking grid. Close the lid and cook until the steam subsides and the indicator light signals that the waffle is ready, 2 to 4 minutes. Carefully open the waffle maker, transfer the waffle to a serving plate and serve right away with toppings. Cook the remaining batter in the same way, serving each waffle as it's ready. Serves 4 to 6. All the kiddos loved their waffle creations, had them licking their plates and asking for more. Before the class concluded, each child went home with an American Girl Parties Cookbook with recipes to make for different occasions and holidays. This book is going to have my girls and I baking up some scrumptious dishes in my new kitchen! Next cooking class in February, kids will be making crepes, another one of my breakfast favorites. 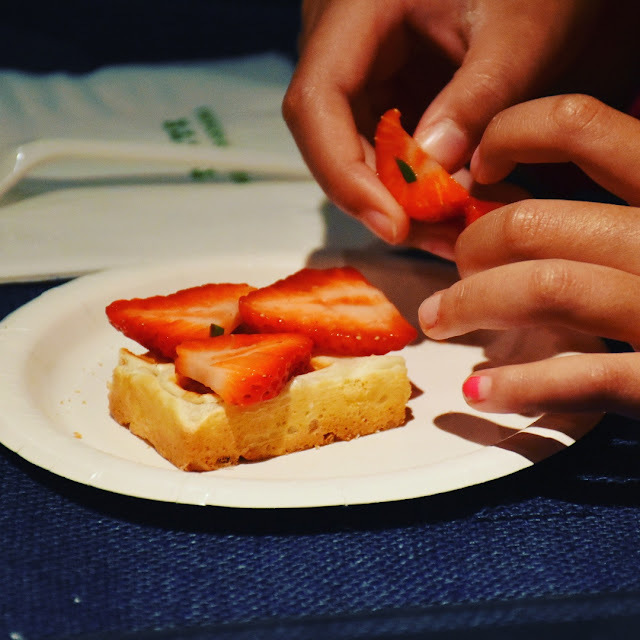 Are you interested in attending cooking classes at Williams-Sonoma? Check out their website for classes at a store near you. This sounds like a fun opportunity. I wish I had a little girl to do stuff like this with. Maybe I'll check and see if we have a class in my area and steal my nieces one weekend and take them to do it. I know that your girls had a blast! This looks like a lot of fun!